Wow…. It looks like a yummy cheesecake…. too love Pixie cheesecake at Fannie May Candies, it’s one of my favorite. I’m intrigued by the coconut flour – I’ll have to keep an eye out for that. oh yum. My husband loves cream cheese frosting. I’ll have to make this. Thanks for posting it. On another note… I have been using tropical traditions coconut flour and do find that it tastes like coconut. I love cakes made with coconut flour! Even DS2 likes them. I guess I need to get some food coloring- got everything else! Might have Red Velvet cake tomorrow! Wow, what a gorgeous cake – and I have all the ingredients! EEK, that’s dangerous! Can’t wait to see how it turns out! Yum yum yum! I’ve added to to my blogs I read list so I don’t miss a single delicious recipe! OMG!!! You are killing me with all these yummy looking desserts:) Red Velvet is my husbands favorite cake. He doesn’t eat low-carb, but I bet he would eat this! Me again! Can I really eat this and not feel guilty? :) I’m really pretty new to the low-carb world. Still trying to adjust my thinking about the fat! This is the worst time of the year for me. Sweets everywhere. I've been strict low carb for 14 months now. I've lost 35 lbs of fat (and gained 15 lbs of muscle from weight lifting) and I don't need to lose any more. But all these temptations sitting around my house right now (for the rest of the family who aren't low carb): seven layer bars, fudge, banana chocolate pie, lemon squares, mints, M&Ms, etc. Oh my! I'm making one of my favorites tonight — your Low carb chocolate pots de creme. Yum Yum Yum! I’m always on the lookout for a cake-y kind of dessert that doesn’t have some different aftertaste. (Think almond flour.) I’ve never quite found anything satisfactory, but I’m not going to stop looking now! I’m going to give this quite yummy-looking dessert a shot after I get the coconut flour shipped to me. I love red velvet cake, I think it might be my favorite flavor! Every year my family has a red velvet cake for Easter, but since going gluten-free I thought I wouldn’t be able to have it again. Now I can have my cake and eat it to! Thanks! Wow, I never thought this could be in any way “healthy”! It was the cake I made for our first Valentine day as a married couple (40 some yrs ago), and I didn’t really like it much. But I’m going to try this one – as soon as I get some coconut flour! This looks like a total crowd pleaser! Thanks for the great recipe! I can see this coming in handy for birthdays and holidays for sure, Lauren! Coconut flour? And I thought I’d been through all of Bob’s products! Sounds interesting and that cake looks like pure iced luxury. You might want to edit your instructions? I used baking powder (yes I just put it in the oven! ), thinking that was the more likely ingredient. What a perfect Christmas cake!! SO pretty red. Again, love that it is gluten-free. Dang, I don’t have the red food color and a storm is on the way. Maybe if I dash out fast!! Lauren, I was so hoping one day you would tackle Red Velvet Cake. Being from the South, Red Velvet cake is always a must for pretty much every birthday in our family. Mine this past October was the first year of my life I didn’t get to have one. I hate to admit this but I did shed a tear or two. Can’t wait to give yours a try. YOU ARE MY HERO. Thank you! I LOVE RVC. And my husband misses it. yay we can have it again!! Ikki – You should be able to find coconut flour at a health food store. Simple – Thanks for the pointer about TT coconut flour! I guess whether you can taste the coconut depends on the recipe. Pepp – Isn’t it amazing what a great cake coconut flour makes? Enjoy the recipe! Gharkness – How did the cake turn out? Thanks for pointing out the error. fit lil – Thank you for reading the blog! Kimberly – You can if you watch your portions, which is easier with cake that’s sugar-free and nutrient rich! Scott – Give coconut flour cake a try! Hope you weather the holiday season well. Glad you enjoyed the pots de creme! Cantering Cookies – Hope you enjoy the gluten-free cake! Red velvet is one of my favorite’s, too. Beth – You’re welcome! Hope you had a wonderful LC holiday! Reva – Cream cheese frosting is good stuff! Michelle – Bob’s Red Mill IS a great line for us gf folks! Sungoddess – Hope you were able to beat the weather and make some cake! Red – Thank you for that tip about finding coconut flour at Indian markets. That is good to know! Jennifer – I hope you get the chance to have your treasured Red Velvet again. 🙂 We all can get emotional over food memories! Rachel – Yay! Hope you make it and enjoy. Your cake looks so gorgeous and moist, definitely festive with that bright color too! I hope you had a fun Christmas :). Oh wow, this cake looks incredible! Lauren, this cake is amazing! I made it today. I don’t have a lot to compare to as I’ve never had red velvet cake before but it’s a very interesting flavor and really gets better after it has sat for while. Really love your blog! Sophie – Hope you had a great Christmas, too! can you use honey or agave in this recipe? Hi Cbattle, I don’t normally work with those sweeteners (just use small amounts of honey occasionally), but I guess you could just add it to the batter and taste it as you go along. If you do try it with honey or agave, let us know how it works out! (You’ll find much more if you google “natural food dyes”)…. I just made this for a halloween party, and I shaped it like a tombstone. I did tweak the icing a little, I think that it might not have been warm enough, so I added some cream to soften and smooth it out. Last night when i baked the cake I thought it was going to be dry, today, its awesome. I also doubled it and baked it in a dark non stick 9×13 pan. Next time I would take the temp down to 325 and cook it for the same amount of time, just to make it a little less dark on the outside and to work with the bigger pan. this looks delicious!! do you think that less eggs (or a natural egg substitute like applesauce or an oil) could be used to reduce the fat content? The frosting looks very smooth. How do you make it that smooth? I am new to low-carb and sugar-free and I am not a baker normally. I attempted this and my cake came out really really dry. I used sour cream instead of yogurt since it gave that option in the directions. Other than that variation, I'm not sure what I did wrong. It certainly in no way looks as moist as yours does. Also, I definitely taste coconut but my husband does not. It's got to be the color, but that cake is the most desirable piece of cake ever made. I'd like to prepare it myself, but I'm not very skilled in the kitchen room. What adjustments might be prudent if one decided to make cupcakes instead of cake? I tried this, and the taste was good…but I am in no way, shape, or form coordinated when it comes to trying to manipulate cake pieces. I made a mess. A tasty mess, but nothing I could share. So, I'm thinking cupcakes might be more my style. Advice from the expert? I have been looking for a gluten free recipe for this cake, I am so excited to try this! coconut flour will be so good. Thanks! 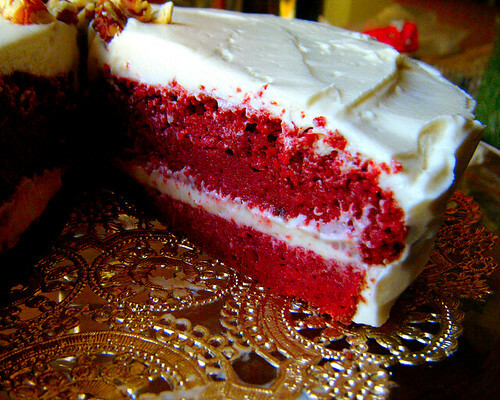 Red Velvet Cake is looking so delicious..I like it.Thanks for posting this recipe..Really very amazing.. I made this once and it was a HUGE success with no alterations. Now by request (borderline coercion) I'm have my second one in the oven for 4th of July. I'll be putting blue berries and strawberries on top in shape of a flag. Your recipes translate to yummy every time. Thank you so much for what you do! I make just the cake, without the frosting & the red food coloring, for a tira misu cake. It works very well as the mascarpone mixture helps with the denseness of the cake. I have a question on the Erithytol in the cake mix. Do I powder 1 cup of this? My experience is that Erithytol doesn't melt like sugar. Also, have you ever tried coming up with the other icing recipe that calls for the milk/flour mixture that is mixed in with 1 cup of butter and 1 cup powdered sugar and vanilla? I was wondering if I could use coconut flour to make the milk/flour thickener?? Any thoughts?? Just made this cake for thanksgiving, I will let you know how it turns out. I did make some alterations to the recipe: I added, buttermilk instead of yogurt and a coconut butter spread (tastes like butter) instead of the actual butter. This looks fabulous! Definitely want to give it a try… Just wondering if I can sub xylitol for the erythritol? Im living in France and erythritol has been impossible to come by so far… Thanks for all your beautiful recipes! My friends and I adored your pumpkin gooey butter cake for thanksgiving and I have made your bean cakes (vanilla and chocolate) numerous times! I don't have erythritol or stevia, but I do have Truvia which is a blend of the two. Could you please tell me how much Truvia I would use in the cake recipe to replace the erythritol and the stevia? Hi Lauren, I made this recipe for a gal at work who loves red velvet cake and apparently only gets it 3x a year 🙂 Since I'm LC, I wanted something LC too..Lauren to the rescue! Even though I thought I might have overbaked the cake part, b/c it was baked in a dark tin, and the cake “looked,” burnt, it was fine when I cut it in half and took a little taste. The frosting was lush, I put in the full measure of E+ and Stevia. I ended up putting chopped pecans around the sides of the cake. Cut a few pieces for home and brought the rest of the cake to work. Oh my, it was scarfed down, I was worried Karen would not be able to try it. Luckily, she was able to try it and proclaimed it just as good as her sister-in-laws (whose cake is made with standard ingredients). Thank you for a wonderful recipe, I can't wait to make it again! Rica. Frankweir – I am glad you've found the recipes helpful! The cake I baked wasn't all that tall either. You could try stacking one layer on top of the other. Make sure your ingredients are at room temperature and dust some gluten-free flour up the sides of the pan. Hope that helps! Rica – Very glad you enjoyed the cake! It's nice to see you commenting. 🙂 Happy your friend at work liked it too! 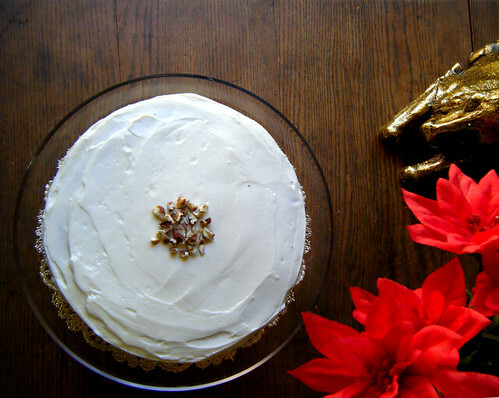 I'm going to sprinkle pecans on the cake next time I make it. Great idea! Yay, I can have chocolate! This recipe may be just what I was looking for! I was thinking of converting it into an ice cream cake, if that’s possible…can you tell me if this cake freezes well? Hi, Shanda! It does freeze well. 🙂 I have definitely frozen it and warmed it up for a quick snack. An ice cream cake is a brilliant idea – yum! Do you have a favorite sugar-free ice cream recipe to use in it? Thanks for the info on freezing the cake. I’m new to the low-carb scene, so (sadly) I do not have an ice cream recipe in mind as of yet, but I’ll let you know if I find one that works well. 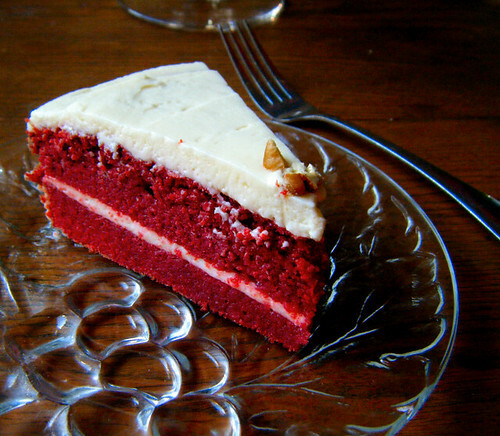 Meanwhile, I made your red velvet cake recipe, and it is DELISH! You are doing amazing work over here! How do you figure there are so few carbs per serving. Erythritol has 4g of carbs per teaspoon. So by my figures there are 96g of carbs in the cream cheese frosting alone. If my figures are wrong please help me. Omg. Amazing holiday dessert idea! I LOVE red velvet!! I can’t wait to make a healthier version!!! Thank you!! Made this cake yesterday! Oh my goodness it’s divine!!!!! Thanks for sharing this recipe!!!! So glad to hear that you enjoyed it, Meredith! Misty, Truvia would definitely work! You would use 3/4 cup of Truvia in this recipe. How do you get down to 6 net carbs for 1/10th of the cake? The best I can get to using truvia as my sweetner is 26? And it isn’t any better with the erythitol. I am pretty new to low carb baking so I wonder if there’s something I’m missing. I looooove red velvet but don’t want to blow it for valentine’s day and would like to use this recipe if I can make it work 🙂 Thanks! Where the recipe for Gluten free Red Velvet cake made with Agave syrup????? That looks very yummy. I will have to try it soon! i tried the recipe but i cut in half, after i add the eggs into butter mixture it is totally curdling then i add dry and wet ingredients alternatively yet still curdle what might happen ?? Sarah, congrats on the little one! Sounds like it’s a busy holiday season for you. Did you end up making the cake?